What is the bill: This bill would make it more difficult to place a citizen initiative on the ballot by amending the Constitution of Maine to require that petition signatures be gathered equally from both of Maine’s two congressional districts. Why it matters: After an election that featured five different citizen-initiated issues on the ballot, Republican lawmakers sponsored more than a dozen bills to restrict the citizen initiative process. The current threshold to put an issue on the ballot in Maine is already one of the highest hurdles in the country. Further restricting that process only gives moneyed interests a greater advantage, while making it harder for genuine grassroots groups. These bills are attacks on our democracy and the ability for citizens and organizations to take action when the legislature cannot or will not. What happened: The bill passed the House with a 2/3rds vote necessary for a constitutional amendment but was referred back to committee by the Senate after failing to garner enough support. The bill could be revisited in the second, shortened session in January. What is the bill: This bill would reduce the lifetime limit for Temporary Assistance for Needy Families (TANF), a critical anti-poverty program and often the only lifeline for struggling families, from 60 months to 36 months. Why it matters: Real, substantive welfare reform should seek to move people out of poverty, not punish them for being poor. Under the LePage administration, childhood poverty has increased at a rate eight times greater than the rest of the nation and more low-income Mainers stripped of assistance have become homeless than have found jobs. 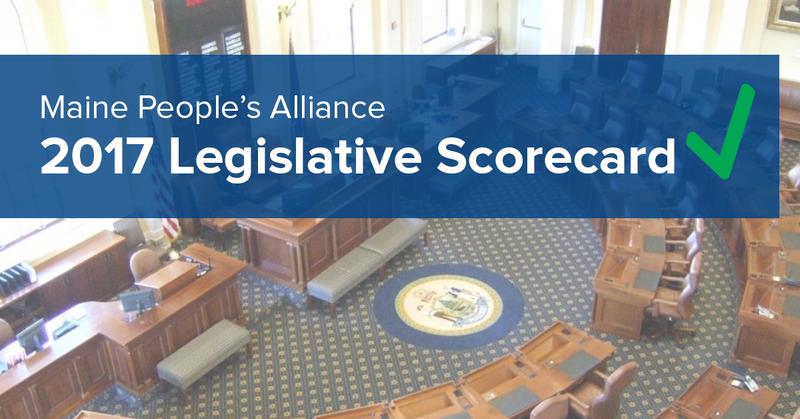 We’re scoring this bill both because of the damage it will do to real Maine families and because it’s symptomatic of a larger problem: a concerted effort to scapegoat poor people and people of color to score political points. What happened: The bill failed to pass in either chamber. What is the bill: This so-called “right to work” bill would limit the ability of workers to form unions and collectively bargain for better pay and conditions at their jobs. The bill would make it illegal for employers and employees to agree that all workers who benefit from a collective bargaining agreement share the costs of collective bargaining and representation. Why it matters: Unions and workplace bargaining are responsible for all of our major gains for working people won over the last century in our country. Our economy is stronger and fairer when all Mainers can have access to jobs that pay a living wage and have the ability to advocate for themselves in the workplace. LD 65 would weaken the best job security protections workers have - the union contract. So-called “right to work” bills are backdoor attempts at weakening unions and their ability to stand up for workers. What happened: The bill failed to garner majority support in either chamber. What is the bill: LD 327 would create separate legal protections in Maine for a fetus, granting it an estate and heirs in the eyes of the law. This “personhood bill” is part of a national strategy supported by groups opposed to women’s reproductive rights to create conflict within the law that could be used to target access to safe, legal abortion. Why it matters: MPA supports access to legal abortion services for all women. This bill would erode women’s rights by granting fetuses a unique and independent status. What happened: The bill narrowly passed the Senate but was defeated in the House and died between chambers in nonconcurrence. What is the bill: This bill would force local law enforcement to act as federal immigration agents and would punish towns and cities that choose not to comply with President Trump's immigration orders by withholding all state funds. Why it matters: We are all safer when there is trust between communities and law enforcement. This bill will undermine that trust by making immigrant communities fear the police. Like other “anti-sanctuary city” bills around the country, it would make immigrants feel less welcome in Maine and punish towns and cities if they choose not to participate in potentially unconstitutional behavior like unlawful detainment and racial profiling. What happened: The bill died after failing to garner majority support in either chamber. What is the bill: This bill repeals part of the minimum wage increase that voters passed overwhelmingly in November by cutting the wage paid to employees who also receive tips. With the passage of the referendum, the tipped wage (previously just $3.75 an hour) was set to increase to the full minimum wage over the next decade. This bill sought to cut it to half of the minimum wage. Why it matters: When it comes to raising wages for workers, no one should be left behind. In Maine, tipped workers are commonly paid a lower, subminimum wage, with tips from customers expected to make up the difference. Restaurant servers and other tipped workers make some of the lowest wages of any profession, and their incomes are highly vulnerable to differences in pay from night to night and season to season, as well as the whims of individual customers. Voters chose to gradually increase the sub-minimum wage for tipped workers until it reached the full wage. Seven other states have "one fair wage" and have stronger restaurant industries, greater restaurant employment and higher rates of tipping than the rest of the country. This aspect of minimum wage laws, which primarily benefits women, has long been a target of corporate interests and the powerful restaurant lobby. What happened: The bill passed in both the House and the Senate and was signed into law by the Governor, undoing the referendum and cutting the tipped wage. What is the bill: LD 784 would have closed a loophole that allows large companies to hide profits made in Maine in offshore tax havens like Liechtenstein and Luxembourg in order to avoid paying taxes. Why it matters: This bill would have held powerful corporations accountable for using accounting gimmicks to avoid paying their fair share of taxes, bringing money back into Maine to help fund critical services. Our state is stronger when everyone pays their fair share and when we show that even the wealthiest corporations can be held to account. .
What happened: The bill passed the House but was voted down in the Senate and died between chambers in nonconcurrence. What is the bill: LD 886 would prohibit a family receiving Temporary Assistance for Needy Families from using an electronic benefit transfer (EBT) card outside of the State of Maine except for in New Hampshire or if the recipient is a victim of domestic violence who is leaving their abuser. Both the Attorney General and the Department of Health and Human Services raised concerns that the bill might violate federal law. Why it matters: This bill represents another in a long string of attempts by Governor LePage and conservative lawmakers to pass policies that punish Maine families simply for being poor. This bill is based on the misguided notion that a significant amount of TANF money is spent out-of-state, despite data showing just the opposite. It effectively bans travel for poor families and is a reminder that legislators from both parties are more willing to legislate based on stereotypes and scrutinize the actions of poor families than take up meaningful policy that helps move Mainers out of poverty. What happened: The bill overwhelmingly passed the Senate but was voted down in the House and died between chambers in nonconcurrence. What is the bill: This bill would prohibit the State Treasurer from depositing funds in any bank that is providing funds, extending credit or otherwise engaged in financing the construction of the Dakota Access pipeline, a massive proposed oil pipeline that runs through sacred tribal lands and could pollute critical water sources. Why it matters: The fight over the construction of the Dakota Access Pipeline (DAPL) is both a climate change issue and an issue of recognizing and respecting the sovereignty of Native American lands. One of the current strategies being pursued to stop the pipeline is a divestment campaign. This is one of the most critical climate and indigenous rights struggles of our day and this was a chance for legislators to take a stand on it. What happened: The bill died after failing to garner a majority of votes in either chamber. What is the bill: LD 1159 would establish a universal right to sick leave for all Maine workers, including paid sick leave for workers at businesses with more than 50 employees. Why it matters: Everyone gets sick. This bill would end the unfair practice of businesses punishing workers for taking time off to recover from an illness or care for a sick family member. By requiring companies to let their workers accrue sick time, LD 1159 guaranteed that no could be fired or have their hours cut just because they get sick. With fewer jobs providing basic benefits it’s increasingly important to require employers offer basic dignities like time off when employees are sick. What happened: The bill passed under the hammer in the House but was voted down in the Senate and died in non-concurrence between chambers. What is the bill: This bill would encourage civic participation by updating Maine’s voter registration process so that people can vote more easily and keep their voter information more up-to-date. With this system, eligible citizens are automatically registered to vote, unless they decline, when they update their address with a state agency like the DMV. Automatic voter registration (AVR) is used in seven states and is supported by Maine's Secretary of State. Why it matters: It is a constitutional right for all eligible Americans to participate in our elections and democracy thrives when we remove barriers that keep people from voting. Automatic voter registration helps to ensure that all citizens have their voices heard. This kind of legislation is particularly important in the face of attacks on voting rights nationally and in states across the country. What is the bill: LD 1237 will would require all insurance plans cover birth control and make at least one option of each method available without a copay. Insurance corporations will also allow women to receive up to 12 months of birth control at a time. Why it matters: 99% of all women will use birth control at some point in their lifetime, and access to birth control is essential for their health and achieving their life goals. Women encounter arbitrary barriers to reproductive health care throughout their lives, and these barriers disproportionately impact low-income women and people of color. Ensuring that women with insurance have birth control covered without a copay and allowing them to receive a year of birth control at a time has been proven to reduce the risk of unintended pregnancy. What happened: The bill passed both chambers and became law without the Governor’s signature. What is the bill: This bill would create a “good Samaritan” exemption from criminal liability for reporting an overdose, which means drug users could call 911 if they see an overdose occur without fear that they might be charged themselves when police arrive. It also created language to establish community-based drug overdose prevention programs, and it included modest funding for needle exchange programs and for naloxone kits. Why it matters: Maine is in the midst of an opioid epidemic that is wreaking havoc on our communities. This is a public health crisis and we can’t jail our way out of it. Fighting this epidemic requires a multifaceted, treatment-first approach and a rethinking of how we criminalize Mainers struggling with addiction. This bill represented a small step in the right direction on a much larger issue. What happened: Despite passing both the House and Senate, the bill was vetoed by Gov. LePage and his veto was sustained in the House. What is the bill: Last November, Mainers approved an initiative to change the way our state elects state and federal lawmakers by instituting ranked-choice voting. The process allows voters to rank candidates in order of preference After candidates with fewer votes are eliminated, the candidate with the majority of votes wins. After the Maine Supreme Court released an advisory opinion questioning the constitutionality of the law, legislators proposed two options: amend the constitution to ensure the law survives a legal challenge or repeal some or all of the law. LD 1625 would have repealed the law in its entirety. Why it matters: We’ve seen the damage that can be done when multiple candidates split the vote and candidates with minority support are elected. Ranked Choice Voting is intended to give Mainers more of a voice in the electoral process and allows them to vote based on their values rather than just strategic considerations. This attempt to repeal the RCV law is part of an unsettling pattern this session of legislators disregarding the outcomes of the election and undermining all of the laws passed by voters at the ballot box. What happened: The bill passed the Senate, failed in the House and died in non-concurrence between the chambers. Because no action was taken, Ranked Choice Voting remains the law of the land. Legislators will have another opportunity to address this issue in the second, shortened session in January.